Did you curl up with Bob Barker (and his reminder to neuter or spay your pet) and some Campbell’s Chicken Noodle soup when you were home sick from school? I watched “The Price is Right” every morning when I visited my grandma in Arizona and my favorite part -other than a themed Showcase Showdown- was the giant wheel contestants got to spin, trying to get close to a dollar. If you don’t harbor the dream of wearing a giant name tag and being called to come on down, perhaps you occasionally envision yourself decked out a la James Bond/Bond Girl and taking down the roulette table. Point is, the prospect of spinning a wheel with the chance of winning a year’s supply of Turtle Wax greatly appeals to our human senses. Which brings me to The Prize Wheel. Prize Wheels come in all shapes, sizes and types. They can be purchased for as little as $49 or upwards. I suggest a simple Google search for “prize wheel” and then browse an amazing number of sites that sell such wheels. And Plink-o boards! Enterprising folks can make one or draft your Physics or Art departments to make one for you as a “student assignment.” When I worked for the Eugene, OR Recreation Department, we had a wooden, hand-made one. It did the trick, but had to be sanded regularly to prevent nasty splinters and was a wee bit heavy to carry. Whatever your budget, there is a prize wheel you can purchase. And it’s the gift that keeps giving! I chose the stand-up 18-slot wheel from Prizewheel.com. The wheel is good quality, portable, sturdy, nice-looking and was sent to me in less than a week. Plus they sent me templates for making slot pieces. So, how do I use it? 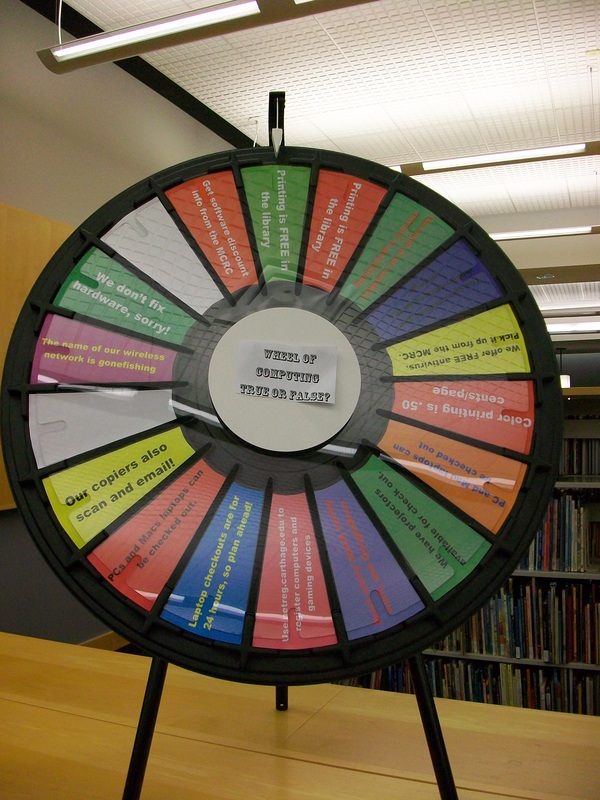 When giving library tours to classes, I use the prize wheel to explain certain parts of the library. If I don’t feel like explaining circulation that day, I’ll pop in the circulation slot pieces. They contain info like: how many items you can check out, check out times, how to renew, about interlibrary loan. I have students spin the wheel, read the slot piece and then tell me if the statement is true or false (usually everything is true.) When I have a student spin, I ask their name, welcome them personally to the library and let ’em at it. They get candy for correct answers. Sometimes only a few students spin, other times I can have all of them spin. How do I want to use it? In research classes, put database names on the slot pieces and have students spin it to determine WHERE to start a search. In research classes, put research strategies on slot pieces and have students spin it to determine HOW to start a search. When we need to convey really important info (oh, like our registration system is TOTALLY NEW and you need to know this stuff to register), take it to student-centered areas. Put questions about registration in slots and if they can answer them correctly, a prize to you! 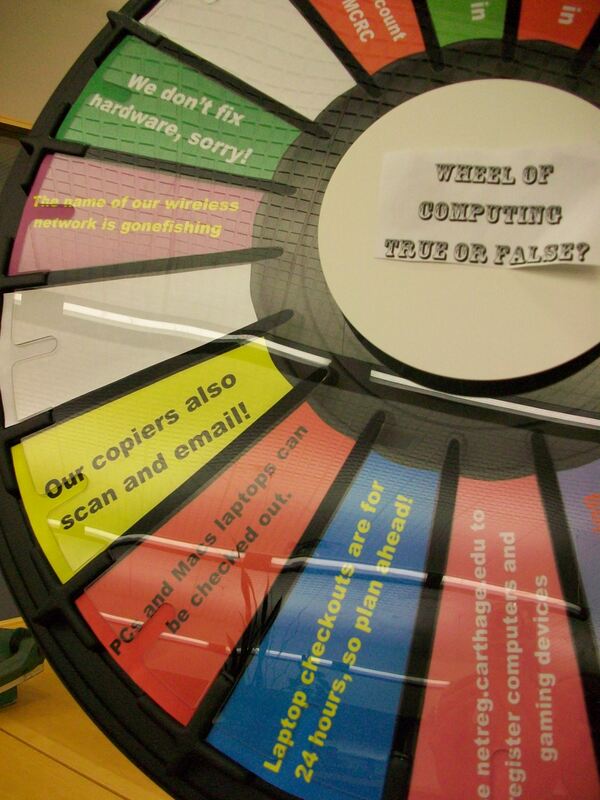 I am glad you are finding so many uses for your Prize Wheel. The 18-Slot Prize Wheel is one of our best-selling products at PrizeWheel.com.